The discovery in Uttar Pradesh’s Sinauli could alter the understanding of contemporary Harappan culture, says Archaeological Society of India; scholars dispute chariot claim. 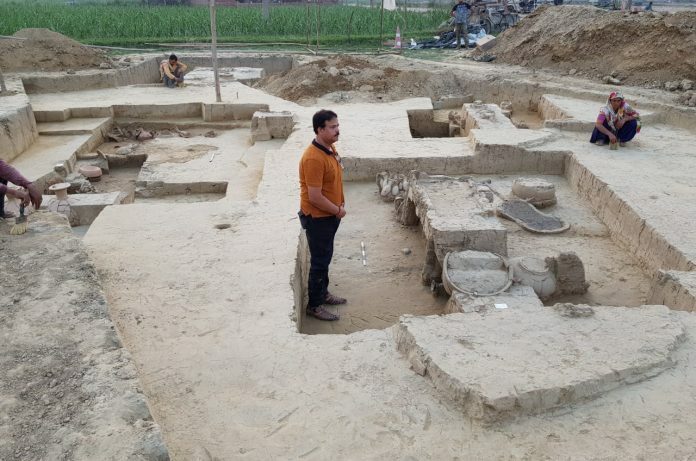 New Delhi: The Archaeological Survey of India (ASI) has claimed to have found the remains of two chariots and eight well-preserved corpses in a burial chamber in Sinauli, Uttar Pradesh. Sinauli is considered an important contemporary Harappan burial site in Bagphat district. The team, according to ASI director (excavations), Sanjay Manjul, found three of the corpses placed in pedestaled coffins, and recovered remains of the two chariots such as wheels, axles and poles, leading to speculation that those buried in the chambers may have been royalty. The new discoveries, especially those of the chariots are a landmark moment since no such physical evidence has been found at a contemporary Harappan site, Manjul said. “This is the very first time such evidence has ever been recovered. The coffins and chariots are something we haven’t encountered before. This discovery is not only important in the context of India, but the world,” Manjul said. According to Manjul, the remains may be from the later Harappan period during the Copper-Bronze age. “The artefacts probably belong to a period between 2000-1800 BCE. It can help us determine how those people lived. It may help re-evaluate how we understood the late Harappan contemporary culture. It is a significant development in the Ganga-Yamuna doab,” Manjul told the ThePrint. There have been other discoveries at Sinauli including in 2005, when the ASI recovered skeletons and pottery at the site. The burial site is also 20 km from the mythical town of Barnawa, which according to the Mahabharat, is where Duryodhana made a house of lac to burn down the Pandavas. Not everyone, however, is buying the ASI’s claims, particularly on the ‘chariots’. Ruchika Sharma, a history doctoral scholar at JNU, says the ASI has to clarify its findings. “We should first obtain clarity on why ASI is calling them chariots. It isn’t uncommon for a late Harappan site to have bullock carts. There is already evidence of such terracotta carts,” she said. “It is very unlikely that they are chariots,” she said. Why this obsession with fools from JNU who opine without studying a subject properly and are brainwashed by leftists?! Ms. Ruchika sharma with due respect to your knowledge.. you didn’t see it, but you say it’s not a chariot n people should go by your rationale to pass a judgement. ASI has unearthed. N they have passed their judgement. Why does a doctoral student’s opinion count in this article? Why is any opinion part of this story? This site lost all credibility just by doing this. Report like journalists, not like hate-filled idiots. With all due disrespect to ms ruchika sharma..
Why do you have allergies from hindutva …. Wht wrong in calling tht mother goddess?? Why do you want to introduce pseudo secularism in every damm thing?? ?